Do you spend long hours sitting at a desk like I do? Do you have sore muscles, achy joints from playing sports or from just plain overdoing it? If you're like I am, I don't like using a bunch of chemicals on or in my body. I try to find organic and natural products when I can. 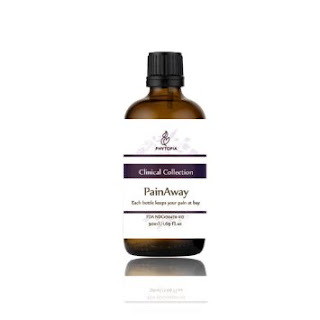 That's why I am happy to tell you about Phytopia's PainAway Essential Oils for Soreness & Pain Relief. It is a blend of organic and natural oils including evening primrose,peppermint, rosemary, eucalyptus, and lavender true oils. This combination of ingredients has a great anti-inflammatory, anti-spasmotic, and analgesic effect on your aches and pains. When you first apply it to your skin there is an almost immediate cooling sensation, relieving stress and tension in your muscles and joints, whether your pain is caused from working hard or playing hard, or sitting at your desk too long. This can be applied to your neck and shoulders, lower back, legs, really wherever you hurt. This is even great for headaches. This is even safe to use while pregnant.